I am almost reluctant to enter into this subject because of all the information already out there that is already confusing. I will try to find a few links to, what I believe, are the most accurate instructions for installing windows and doors. It is, perhaps, a little early to approach this subject, as we haven’t really got into the details on any other part of house building yet. It might, however, influence your choice of windows, and you may have to order them as much as 90 days ahead, and certainly 45 days, to ensure timely delivery. Don’t attempt to install windows by yourself. For even a small window, you should have some one inside to make certain the window is properly centered in the opening. Make certain the rough opening allows about 1/2 inch of free space on all sides of the window. I have found that you can not rely on the manufacturers to give you the right rough opening size. They often try to second guess you. The best is to actually measure the window, or insist that the supplier give you the exact measurements of the frame. Windows are constructed in so many ways, that it is not possible give instructions that are applicable in all cases. The first consideration is building codes, and of course these must be followed when installing windows or doors. They may simply say that windows are to be installed according to manufacturers instructions. Secondly, the manufacturers instructions should be adhered to, as closely as possible. Both windows and doors for new construction are commonly supplied with nailing flanges with which they can be attached to the framing of the building from outside. Those supplied with a brick mold attached are usually intended as replacement windows. A brick mold is a molding of softwood or other material specifically used to case around the outside of a door or window. This does not mean they are not interchangeable, if you happen to get a deal. Those with flanges are attached with 1.5 inch roofing nails, or with screws. I prefer the nails, as they are less likely to interfere with subsequent finishing. Wooden brick mold should be attached with 2 inch or longer finishing nails applied through the face and set. A vinyl brick mold may have a recess for screws. Again, follow the manufacturers instructions. It is my opinion that nailing flanges alone do not secure a window quit well enough. It may allow enough flex to affect interior and exterior seals, if there are sudden changes in air pressure from outside or inside. Loud noises, or slamming doors, can cause pressure differentials which can be substantial on a large surface such as a window. On some windows, you may be able to fasten though the frame, but you probably would not want to. I think that the best solution all around is to use low expansion foam, specially formulated for windows and doors, both for insulation, and to secure the window. Carefully applied, it also provides an air and moisture barrier, although I wouldn’t rely on this alone, for that purpose. Of course, if the foam is to secure the window, it must make direct contact with both the window frame and the framing of the house. There should not be house wrap or flashing interfering with this bond. The exception is the pan flashing at the bottom of the rough opening. Care must be taken when applying the foam, as to not warp the frame and making the window inoperable. When spray foam first became available in aerosol cans, it generally wasn’t available in low expansion formulations. A friend of mine, who owns a glass shop, experimented with it when replacing the windows in his own house. When the job was completed, he was unable to open any of his windows. To this day, he is leery of spray foam. I have not seen much damage to framing by water infiltration from the exterior, but then we have a fairly dry climate. I have seen a lot of rot in wooden window frames that were not properly maintained with caulk, and paint, or exterior cladding. I did, in one case, have to replace an entire wall below a window. It was destroyed by rot, caused by moisture infiltration from inside. The window was placed at about head level above a bathtub that had a shower installed. Of course, there was no exhaust fan in the bathroom. Bad design first and poor sealing second. Make and install a pan flashing, or purchase and install a ready made one. You can make corners, purchase them, or the material you use may be flexible enough that they are not required. Extend this flashing a foot on either side of the opening. Caulk the top and side edges of the opening with a butyl type caulk before installing the window. Try to center the window in the opening with a ½ inch space all around. Use bottom shims on larger windows that have more than one panel. Make certain the window is plumb and square, and determine that it will operate before fastening permanently. Some may say that a flashing is not necessary when installing windows with nailing fins, but I prefer to see the extra layer of protection. You could even add yet another layer of metal flashing for added insurance, but fasteners may cause some unwanted penetrations. As I said before, follow the manufacturers recommendations. I like the idea of self adhesive and self sealing rubberized flashing strip, but it does not seem to be available in all areas. You can use strips cut from the material used for roofing, but the manufacturers of it may not condone it for this purpose, for liability reasons. You can also use asphalt impregnated building paper for flashing material. Use strips about one foot wide. Apply flashing down the sides covering the nailing strip and extending a few inches above the window and covering the pan flashing. If the top of the window is more than a foot below an eave, add a rain cap along the top at this point. Place the upper flashing so it covers the nailer and the ends of both side flashings. Pull the flap of house wrap down, and caulk and tape it in place. If you are using brick mold, at this point caulk the edges. If you are applying J trim for vinyl siding, caulk this as well. Seal from the interior with spray foam, using two or three passes, a few minutes apart. Make certain the window is well sealed against moisture penetration from the interior when insulating and applying vapor barrier. Follow nearly the same procedure when installing prehung exterior doors, as for installing windows. Caulk the bottoms well. Consider placing a strip of sill gasket underneath. To square a door, first make sure the base is level or slightly higher on the hinge side. If not, shim the bottom. Shim the hinge side of the door at the hinges to center the door, and to make it plumb. Make certain both sides are plumb in both directions, before they are fastened. Fasten with #10 screws, long enough to penetrate into the framing, through one hole in each of the hinges. Do not over tighten. Use the door as a square by ensuring equal clearances on the top and lock side. Shim and fasten with 2 inch finishing nails placed at the shims. place them so they will be hidden by the closed door or the seal. Three or four should be sufficient. Screws may be used if you drill first to prevent possible splitting. In fact, I prefer to drill first for large size finishing nails as well. Install the lock set and dead bolt. Flash, and foam in place, in the same manner as a window. For security, it is a good idea to use screws long enough to reach into the framing when attaching striker plates, at least for the deadbolt. It may be worthwhile to purchase a heavier plate which could be attached with more screws. I will mention again, if there is a window within reach use a deadbolt that is keyed from both sides. Shim the frame behind them to prevent distortion. I once owned a mobile home that had a dead bolt surface mounted on the interior. I came home one day, and not realizing the door was bolted, simply opened it and walked in. It had been so poorly installed that I did not even notice the resistance. I think we should look for better security than that. If any of the above conflicts with building codes or manufacturers instructions then go with the codes or instructions to avoid possible warranty problems. If that is clear as mud it might get worse as you study further. Every builder uses slightly different methods, and has different opinions. Even the manufacturers rarely agree on best practices. Some methods may be unnecessarily complicated, and some may be not quite adequate. From all this you have to sort out what seems to be the best approach with the available materials. The thing to remember; the main purpose of flashing when installing windows or doors is to stop air infiltration, and to keep moisture away from the framing and insulation. Work from the bottom up, as water runs down, and you want to overlap the layers. I am not including any pictures with this post, but I believe the links provide enough visuals. This entry was posted in Uncategorized and tagged doors, flashing, windows on March 12, 2013 by Rick. Windows and doors are not only necessary for the proper functioning and livability of your home. They can add a great deal to the beauty and architectural interest of any building. The variety available in window design, functioning and construction is huge, and largely limited only by your imagination. In some cases, you may even want to design a portion of your house around a window or group of windows. The front entry door can make a statement about you and your house, and suggest what a visitor may find inside. An entry can be large and ornate, suggesting a palatial interior, or it can be warm and inviting, suggesting a cozy space inside. Doors are often of glass, or partially so, and often have windows surrounding them as an integral part of the entry. The purposes of doors and windows need to be considered ,when designing your house, and before purchase. Doors are usually chosen and placed with utility in mind, with appearance as the secondary consideration. There may be several motives for choosing and placing a window. Interior and exterior appearance is always a factor for windows. Ventilation should be considered. Is a window placed to take advantage of a pleasing view, or do you want to watch your children in the yard? Is light a part of the equation? What about security, or safe egress, from bedrooms in an emergency? Windows can open or be a non opening “picture” window or a combination. There are also bay windows, bow windows, skylights and garden windows. Picture windows may be used in garages, outbuildings, in places where they are hard to reach, or if the shape of the window is unusual. Windows that open can save some of the energy used for cooling, if placed to provide cross ventilation. A Window that opens widely enough to provide an escape route from bedrooms are required by most building codes. Removable screens should be provided to prevent insects, birds and animals from entering. Windows that open are normally rectangular, but there are different types. A common and inexpensive type is the slider, which can be horizontal or vertical. They can be double hung, as in a vertical slider that opens from either the top or the bottom, or single hung in which only one half opens. They can be a casement window which opens similarly to a door, awning which swings open from the bottom, or hopper which opens from the top. These three may have a crank mechanism for opening and closing, and locks which tighten them. They provide a better air seal than sliders which need to be a little loose to operate. An awning type window can afford a little better protection against the elements if inadvertently left open. Material used in making the window frames is varied. Vinyl has become quite popular in recent years. Economy, low maintenance, and low thermal conductivity are some of the reasons. Vinyl is not damaged by moisture which is an important consideration in cold climates where frost may form on the inside of the glass and later melt. Voids can be incorporated to provide thermal breaks. Expansion and contraction is minimal which can mean a window will remain easy to open in different conditions. Paint does not adhere well, so choose your original color carefully. Wood is another popular choice, which gives more interior decorating options. The exterior should be clad with metal or vinyl to reduce maintenance. Painting or staining is possible with wood. Moisture is the bane of wood, and causes rot and mold problems. Wood will swell when damp, and may make it difficult to open windows. Metal is seldom used anymore, except for structural reasons. The main disadvantage is its conductivity, which can create thermal bridging. The thermal qualities of windows will vary by a wide percentage, but no matter how good, their insulating value is still pretty dismal. It is quite expensive to achieve an R rating of over 4, and more common is a rating of less than 3.5. A double glass window sealed with an inert gas inside and with a low E coating is probably the best you will get at a reasonable payback. The low E coating is inexpensive and very worthwhile. This will give a rating of about 3.2. Compare this to a normal 2 x 6 wall, which has a rating of about 22 when properly insulated. This is a compelling argument for keeping window space to a minimum. Building codes may require that 10% of the wall space be devoted to window. Most people would want more than this. I don,t believe in spending large sums on extra window efficiency. The percentage gain on the window may be quite large, but the overall energy savings are quite small. Better options may be lined window treatments, or wide eaves to block the sun. Your motives , however, could be quite different from simply looking at the best value. Note: R values can be confusing and are expressed differently in much of the world. Please use this link for an explanation which I hope doesn’t confuse you more. Doors can be purchased in many styles and materials, and at costs ranging from a couple of hundred dollars up to several thousand. Most people would spend the most attention and money on a front door, and use more utilitarian doors in other locations. A door may be mostly of glass, and as such, is similar to a window. It can have various sized and shaped openings with glass, often called lites, which may be decorative. Stained glass can give interesting effects. There can be one or more side lites, and there may be a transom window over the door, which may or may not open. Double doors are a possible choice, and are commonly used for a patio entry, as well as for a front entrance. There are several different styles. Sliding glass doors are popular for the patio or deck, and can open from either side, or both sides. It is possible to have blinds built in between the glass panels on sealed double glass doors. Maintaining a sliding door free from air leaks is more difficult than with other types. 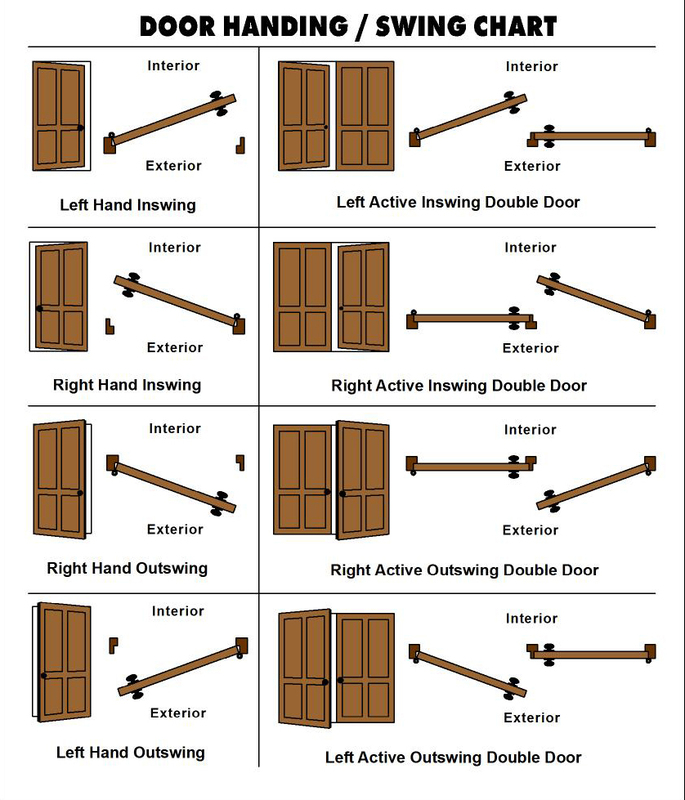 When ordering doors, you must specify left or right swing and in or out opening. An in swing is not as easy to make secure, and their use is uncommon in exterior doors. All exterior doors should have a deadbolt lock, and if there is glass within reach, it should be keyed from both sides. Material besides glass for exterior doors include, wood, metal and fiberglass. Wood can be one of several species, and can be finished in different ways. There are craftsmen who make hand carved wooden doors to order, which can be beautiful and distinctive. One way your front entry can really make a statement. Metal doors for residential use usually have a wooden frame, and are composed of a sandwich of wood and an insulating material between two sheets of steel. They require painting for protection against moisture. These are likely the most economical door. Fiberglass doors may be superior for energy efficiency and maintenance, but are more costly in most cases. A door like a window, is not great as far as insulating values are concerned. Keeping them well sealed requires regular maintenance. Storm doors may be a help, but the jury is still out on their insulating value. I think they have value beyond simple energy efficiency, such as reducing freeze ups and as a screen door if so equipped. Careful window and door selections can greatly add to the appeal of your home and its eventual evaluation. This entry was posted in Uncategorized and tagged doors, locks, low-E, R rating, sealing, walls, windows on March 10, 2013 by Rick.